Hardland is a gorgeous looking ARPG in early access. The first thing that'll grab a lot of people's attention would probably be it's aesthetics. It's design being inspired by claymation the world and it's characters does have a pretty cartoony "doughiness" to it. At times the game feels almost like playing an interactive Pixar Movie. 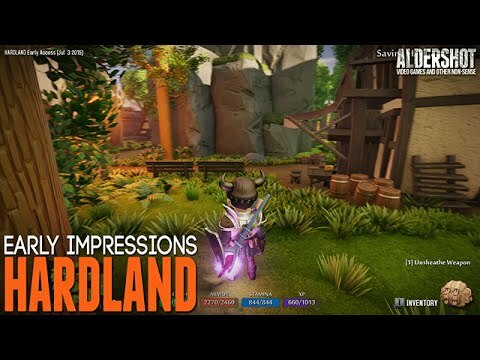 Hardland as an ARPG is pretty simple overall. Go around a vast world, where the town areas are hand designed while the dungeons and wilderness are randomly generated. Kill some mobs, level up, find loot, explore, and maybe pick up a side quest or 2 along the way. There's no main quest that I've found so the game is very open to however the player decides to play it. Hardland does a lot of stuff right. The graphics are impressive, it's well optimized and stable, it features an open sandbox for the player to explore with RNG elements keeping things fresh. These are all enjoyable factors of the game, but Hardland also does a lot of stuff wrong as well. With out a main quest and the side quest being mostly of the fetch variety, the game lacks a sense of direction. At first most players will be wandering around wondering what they're supposed to be doing before realizing, wandering around is what they're supposed to be doing. The game also lacks interest points. It's great that Hardland gives the player a vast and open world to explore, but I haven't found much interesting things to find. Sure there are some chests, and some side quest (again mostly fetch quests) laying around, but nothing that truly grabbed my attention. In such a vast and gorgeous looking world, it's a shame that I have to report on it's at times, empty feeling. The game also features fairly primitive mechanics. The leveling up system is basic, the equipment system is basic, even the combat feels basic. The game also suffers from a few quality of life issues. There is only 1 save slot, and all the items you collect are ordered by alphabetical. There is no equipment tab, food tab, or any sense of organization at all. So I've mentioned a laundry list of things I took issues with, but I'm still feeling pretty positive about Hardland. I think the game has a ton of potential, and hope to see the game grow and add content as it continues forward. I think if the devs can overhaul the combat, and fill the world with more interesting discoveries, it's open world idea could very well be something special. It already has a gorgeous art design as a strong foundation, it just needs to be built upon at this point. Overall Hardland is an ARPG that is bursting at the seams with potential. That potential just needs to be realized.